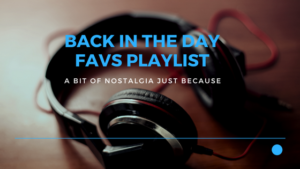 Ever had those songs from your younger days growing up that you still remember or if you heard it, you would probably attribute an unforgettable memory to it? It could be the simplest memory such as where you were, what you were doing or the emotions you felt when you heard the song for the first time. Well, that’s what this playlist is to me. It’s filled with songs I grew up on over the years that I could enjoy just the same today as when I heard them years ago. Some I remember dancing and singing to in my room. Whatever the reasons were, these tunes will always be classics to me from ‘back in the day.’ Back when music was good, compared to today. But, all generations think that about peaks in their music era, don’t they? I personally loved music from the 80s and 90s. Since I’m a baby of the 80s, I guess it makes sense. Every generation is different and we all eventually change to some degree in the things we get into and the things we like over the years. However, one thing will always be constant and that’s the music. Whether you listen to the same track today or ten years from now, it will be constant, a piece of creation that continues to live on through our analog and now digital age. At the end of the day, it’s nice to look back every once in a while, reminisce and get that nostalgic feeling from past music you listened to. It’s also nice to hear artists you used to like who are not active in the mainstream media anymore or left their music career to pursue other things in life. It has over 7 hours of music currently, which is not even the tip of the iceberg, but I will continue to add to it as new tunes are discovered along the way. Be sure to follow the playlist and feel free to make suggestions that you think I should add.